Whether you are looking to get away for a relaxing break, taking leisurely walks through the old town and the surrounding south downs countryside, eating out in the town’s selection of cafes, bars and restaurants, swimming in the outdoor Lido, or looking for a place from which to explore the many attractions of Arundel, Sussex and the South Coast with friends or family, St George’s Cottage is the perfect base for your holiday. We used to live and work in Sussex and bought the cottage in 2010 so that we could continue to enjoy spending time in West Sussex with our three children. We love visiting throughout the year, going on days out to the beach, visiting Arundel castle, eating out in the many different cafes, pubs and restaurants and going to London on the train. The modern newly fitted kitchen is fully equipped and includes an oven and hob, fridge, washing machine, microwave and dishwasher. The kitchen is stocked with plenty of utensils, cutlery, crockery and coffee maker etc. Outside: A small secluded and quiet courtyard accessed from the kitchen and the lane at the front of the house. There is free on road parking to the front of the cottage and surrounding roads, however there is no reserved on-street parking available in Arundel. Utility Room: No separate utility room Cleaning / Towels / Linen / Maid service: We will provide you with all the bed linen and towels and hand towels. Tea towels & oven gloves are also provided. Perfect, very comfortable, clean and homely. Very comfortable cottage in beautiful town. Owner informed us well. We loved it. Whilst fairly small the cottage was plenty big enough for three adults. 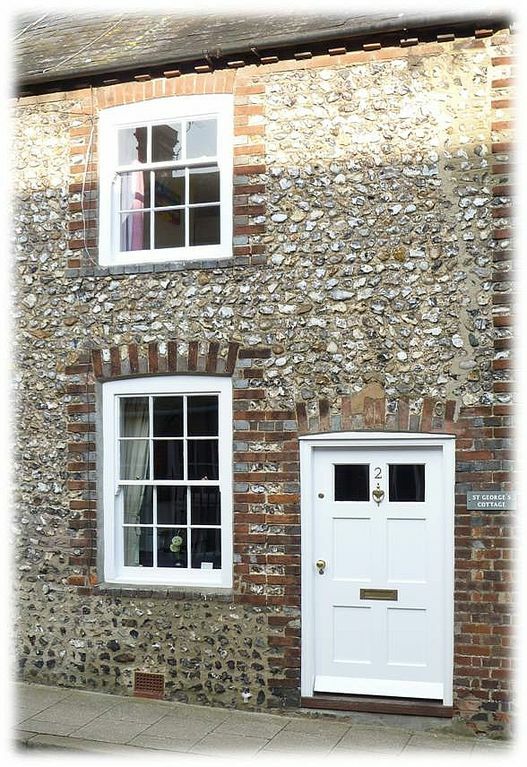 This Victorian cottage is typical of picturesque Arundel and true to properties of this era it had a small kitchen, steep stairs and uneven floorboards. Therefore for anyone with mobility issues this would not be appropriate. On a safety note a stair gate at the top of the stairs would be safer with children who may wonder in the night from the bunk bedroom along to the bathroom. In addition some type of hand rail going up to the attic room would also be appropriate. The cottage was very well furnished, clean and reasonably well equipped although lack of space possibly makes it difficult to equip too fully. Cottage was lovely but weather let us down. Cottage was comfortable.Would have been cosier if there was an open fire and a larger screen television. Had everything that you need for your time away. Provided a baby cot and was put up for when we arrived. Much better than being stuck in a hotel. Brighton is a 50 min drive. The historic walled city of Chichester is 15 mins away and also has an impressive cathedral, the Pallant house gallery and Chichester Festival Theatre. Petworth is 15 mins away with an abundance of antique shops. Bignor Roman Villa is 10 mins away. Goodwood for all its events - motor racing, horse racing and air displays is 15 min away. There are a wide variety of restaurants in Arundel catering for all culinary tastes. There are some excellent pubs in the area, with the closest, The Kings Arms, a 1 minute walk away! The nearest post office is on the high street in Arundel, where you'll find several banks and shops, including a supermarket. Arundel Castle is open from spring throughout the summer and has a wonderful garden too or you could hire a rowing boat at Swanbourne lake just along from the castle and also feed the ducks and wild birds while you are there. Take a boat ride up the river to the Black Rabbit pub, or play golf at the pitch and putt on Mill road.